Richard Serra, 7, 2011. Composed of 7 steel plates that are 80 feet high, 8 feet wide and 4 inches thick, the sculpture is 10 feet wide at the bottom and 9 feet wide at the top. DOHA.- On December 15, in the presence of His Highness the Emir, Sheikh Hamad Bin Khalifa Al-Thani and more than 700 dignitaries and special guests, Qatar Museums Authority inaugurated the MIA Park, a new cultural destination on Dohas Corniche. The inaugural ceremony included remarks by Qatar Museums Authority Chairperson Her Excellency Sheikha Al Mayassa bint Hamad bin Khalifa Al-Thani and master sculptor Richard Serra, and Hughes de Coursons The Magic Lutes was performed by the Qatar Philharmonic Orchestra in a temporary concert shell, inspired by the nearby Museum of Islamic Art designed by I.M. Pei. A dramatic light show herald the presentation, with guests seated facing Doha Bay to allow scenic views of MIA Park and the citys skyline. MIA Park is a new 62-acre (25-hectare) public space set to transform the waterfront of Doha, Qatar. 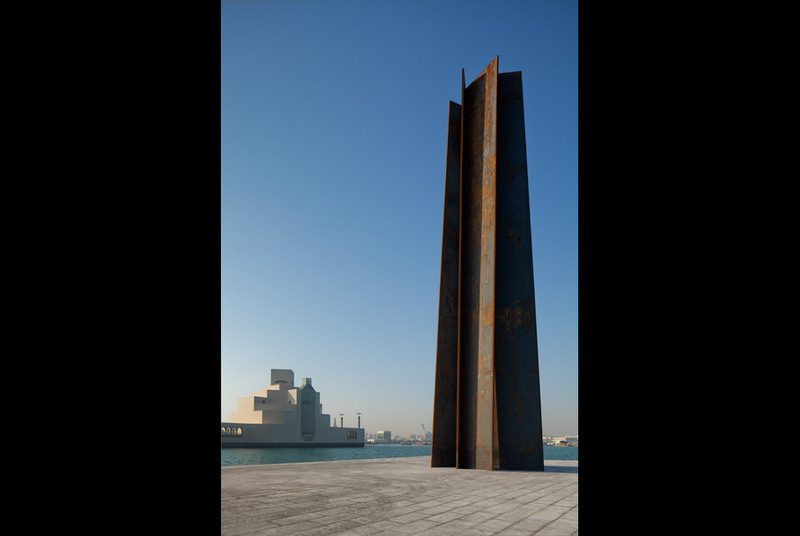 Developed by Qatar Museums Authority (QMA) and located on the grounds of the acclaimed MIA, the Park includes a sculpture plaza featuring a newly commissioned work by Richard Serra titled 7, the artists first public work in the Middle East. Free to the public, MIA Park will open in early January 2012 with a community-wide celebration, including: horseback riding, traditional Qatari folkdance and many other family activities throughout the park. The opening event also will feature live musical performances by jazz groups and local bands, as well as food tastings at the Parks cafés and kiosks. The Park includes approximately one mile (2 kilometers) of lighted pedestrian stone pathways and a formal 2,600-foot (800-meter) palm ringed cove promenade connecting the MIA to a 12-acre (5-hectare) man-made peninsula of geometrically shaped abstracted dunes unveiling panoramic views of the West Bay. Jetting out into Doha Bay is a pier specially created to support Serras 7. The nearly 200-foot-long (60-meter-long), 79-foot-wide (24-meter-wide) sculpture plaza on the pier is clad in honed Shanxi Black granite surrounded by water with an elegant set of stairs that rise up from the waters edge on the south side of the plaza, facing the MIA. Composed of seven steel plates that are 80 feet (24 meters) high, 8 feet (2.4 meters) wide and 4 inches (10 cm) thick, 7 is Serras tallest vertical sculpture to date. The sculpture is 10 feet (3 meters) wide at the bottom and nine feet (2.7 meters) wide at the top. MIA Park also features a childrens area with an interactive playground and a small cove created in Doha Bay for water activities. Two cafés and a kiosk will offer food, souvenirs and gift items. The Park will be furnished with outdoor furniture designed by Kettal, B+B Italia and Morosso. Visitors also will enjoy complimentary WiFi access throughout the park and interactive digital signage will be available with information on various activities taking place around Doha. Year-round public activities at MIA Park will include film screenings, sports events, storytelling programs and art workshops. Details on an upcoming Film Series in February 2012 will be announced shortly. MIA Park will be developed in phases, with additional elements and amenities to be announced in the future. Richard Serra is one of the most significant artists of his generation. His groundbreaking sculpture explores the exchange between artwork, site, and viewer. He has produced large-scale, site-specific sculptures for architectural, urban, and landscape settings spanning the globe, from Iceland to New Zealand. In addition to "Richard Serra Drawing: A Retrospective, which started at the Metropolitan Museum of Art in New York in 2011, is currently on view at the San Francisco Museum of Modern Art, and ends at the Menil Collection in Houston in 2012, other major recent projects include: Promenade, a course of five steel sculptural elements towering seventeen meters, for MONUMENTA at the Grand Palais in Paris (2008); "Richard Serra Sculpture: Forty Years" at The Museum of Modern Art, New York (2007); and the eight-part permanent installation The Matter of Time at the Guggenheim bilbao (2005). Serra was born in 1939 in San Francisco. While working in steel mills to support himself, he attended the University of California at Berkeley and Santa Barbara from 1957 to 1961, receiving a BA in English literature. He then studied as a painter at Yale University, New Haven, from 1961 to 1964, completing his BFA and MFA there. In 1964 and 1965 Serra received a Yale Traveling Fellowship and traveled to Paris, and he spent much of the following year in Florence on a Fulbright grant, traveling throughout southern Europe, Turkey and northern Africa.